Camping in a tent and holidays for families in Sardinia: a winning combination on offer at Camping Cala Ginepro! Camping in a tent reawakens your sense of adventure. On our campsite in Orosei you’ll find everything you could want, thanks to our offers, our wonderful sun-kissed island and the pristine water of Cala Ginepro. Enjoy unforgettable family holidays in Sardinia, in harmony with benevolent Mother Nature! During your stay, you can choose from three direct access points to the shore, with endless stretches of fine, white sand and the evocative rocks of pink granite, for enhancing moments of tranquillity. 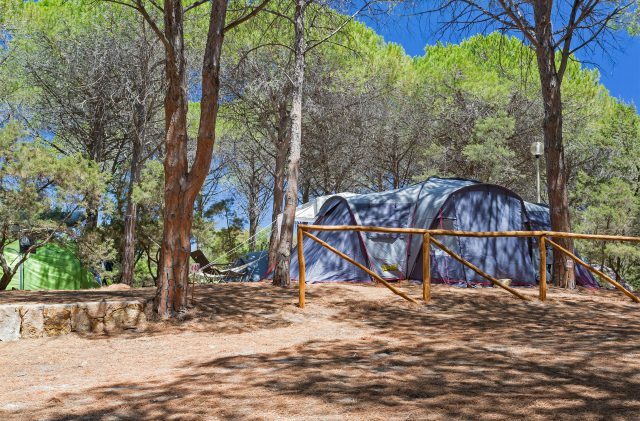 The campsite’s lush pine forest offers mostly shaded pitches, which are the ideal base for your holiday in Orosei, on the Italian island of Sardinia. There are numerous pitches on the campsite for those travelling with a medium-sized tent (max 20m²). If you’re on the lookout for specific packages for family holidays in Sardinia, Camping Cala Ginepro offers a rich array of facilities. The cost of the pitch includes the supply of electricity, the use of hot showers, the entry of a car or motorbike, and parking in the dedicated areas. During summer you can sit back and soak up all the entertainment that is laid on, which is ideal for families. The beaches of Cala Ginepro and Sa Mattanosa, which have shallow seabeds that are suitable for children, are easy to reach thanks to the wooden walkways, which are comfortable even if you’re pushing a pram.